The teenager was one of 22 people killed in the Manchester Arena bombing on May 22, 2017. 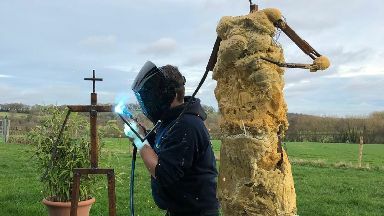 Work is continuing on the bronze sculpture - featuring a young female bagpiper with her pipes at rest, reaching out a hand to a young boy also learning the instrument - which is hoped to be established on the Isle of Barra next year. The community rallied together after the 14-year-old was one of the 22 people killed in the Manchester Arena terror attack on May 22, 2017, with a trust set up in her name to help fund a memorial. 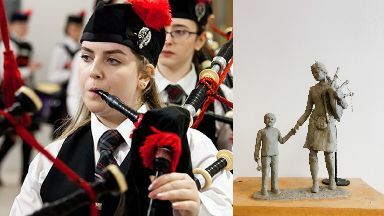 Although Eilidh was a keen piper, the life-size sculpture by Essex-based artist Jenna Gearing is not based on the teenager's own appearance, or that of any specific individual, at the wish of her family. Instead it is said to be a visual representation of the love, unity, resilience and diversity encompassing her life and the Outer Hebridean island she called home. Eilidh's father Roddy MacLeod said: "As a family losing Eilidh in such a cruel way was truly horrific. "Forming Eilidh's Trust and working together with Jenna along with family and friends on Barra has been an uplifting and positive experience for us all. "We are incredibly grateful to both ACT and Jenna for their commitment and passion in supporting Eilidh's legacy and the resilient community in which she was raised." Islanders were given their first look at the design on Thursday, which has also been funded by the Ardonagh Community Trust, of which Eilidh's aunt Margaret MacNeil was an employee. Last year a song was released to help funds for the permanent memorial by Gearing, who said she felt "so incredibly privileged to be part of such an important journey". The artist added: "The events at the Manchester bombings were an incomprehensible tragedy but the strength, unity and resilience shown by all the families and communities have been astounding. "This sculpture represents a deeper meaning than its physical presence. It is one that portrays the immense unity and understanding between a community of different generations, cultures and backgrounds. "I endeavour to do Eilidh's family justice and my hope is that the sculpture created will provide a place for reflection and to serve an endless reminder of the wonderful girl that remains so fondly in our hearts." Suzanne White, of the Eilidh MacLeod Memorial Trust, also said: "Our intention for the sculpture of a young female piper is to ensure that Eilidh's life and her legacy are celebrated appropriately. "The design has really captured her spirit and created a striking memorial to a very special young girl. "It is a beautiful design which honours the community values of unity, love, support and a willingness to help others whilst at the same time capturing Eilidh's passion for music. "Our intention is that the memorial will provide the communities of Barra and Vatersay and those from further afield with a place of quiet reflection and inspiration."